LAW ANIMATED WORLD: Editorial, "Right to Privacy and Corruption Cases", in LAW ANIMATED WORLD, 15 June 2015 issue, Vol. 11, Part 1, No. 11. 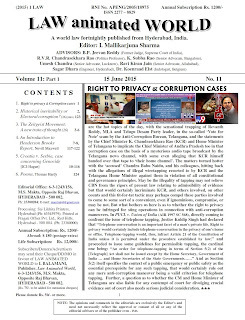 Editorial, "Right to Privacy and Corruption Cases", in LAW ANIMATED WORLD, 15 June 2015 issue, Vol. 11, Part 1, No. 11.